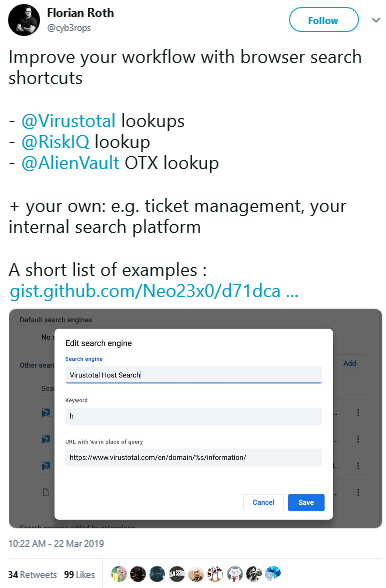 Tis is great for anyone who uses several tools with different options each time (like nmap, sqlmap, dirsearch, wfuzz, massdns…). SAML – Want to pen-test? Pwn2Own Vancouver 2019 – The Schedule and Live Results: The @fluoroacetate duo found bugs on Safari, Virtualbox, VMware Workstation, Firefox, Edge & Chromium, and left with $375,000 plus a Tesla Model 3! We created a collection of our favorite pentest & bug bounty related tweets shared this past week. You’re welcome to read them directly on Twitter: Tweets from 03/15/2019 to 03/22/2019.